This shows a typical office visit for a defibrillator check (called interrogation). The programmer (A) has all the software necessary to check and program the defibrillator (or pacemaker). Many devices allow wireless interrogations but many still require a wand (B) that is held over the pacemaker to communicate with the device. Part of the shared decision making process is ensuring patients understand the long-term followup required after device implantation. What is a Defibrillator? Cardiologist’s Guide for Patients and Care Providers can be used as a Shared Decision Making (SDM) tool as mandated by Medicare’s recent Decision Memo for Implantable Cardioverter Defibrillators (https://www.cms.gov/medicare-coverage-database/details/nca-decision-memo.aspx?NCAId=288). The Medicare memo states the “a SDM encounter prior to initial ICD implantation is a critical step in empowering patient choice in their treatment plan. While ICDs have remained a common treatment option for many years, the strength of evidence for an ICD benefit is different for different patient populations.” This SDM encounter mandates an evidence-based decision tool that discusses more than just the risk and benefits of defibrillator implantation. What is a Defibrillator? is a 216-page, evidence-based SDM tool that addresses all aspects of how defibrillators work and the conditions they treat. We discuss how doctors determine whether patients are good candidates for defibrillators and provides an overview of the implantation process. Potential complications both before and after defibrillator implantation are discussed, as is surgical recovery and follow-up treatment. There are extensive discussions on the long-term care and follow-up required including the psychosocial aspects of defibrillator implantation. Particular emphasis is placed upon possible device advisories as well as end-of-life issues including possible deactivation of defibrillators. For readers having difficulty with medical terminology, there is a helpful glossary at the back of the book. Patients, caregivers, and family members involved in the Shared Decision Making process will benefit from the straightforward explanations. If you’re patients are candidates for defibrillator implantation, this book meets the requirements of the SDM decision tool and helps your patients approach surgery with a full understanding of the procedure and what it means to their quality of life. Please message me if your practice or facility is interested in bulk discount pricing as well as customized editions that feature your logo on the cover as well as an introduction from your Heart Rhythm Center director or CEO of health system. This PA and Lateral CXR was taken the day after an uneventful defibrillator implantation. I have saved these images for close to a decade as I never wanted to forget this is always a possibility. In full disclosure, this was not a procedure I performed. This was an eye opening case of an operative sponge left in the pocket. As I recall, the patient was very gracious and sponge was extracted uneventfully the following day. Years later a practice partner of mine called me about an interesting case he was doing on a generator change in a can that went ERI at 8 years. He found an oddly healing pocket and ultimately dissected this sponge (see following picture) out from the pocket. Amazing that the pocket healed at all though clearly the pocket was very abnormal. If you or a loved one requires a defibrillator implant, you’ll undoubtedly have many questions—questions that can’t always be adequately explained in a forty-five minute doctor’s appointment. I recently published a complete, easy-to-understand guide to defibrillator implantation. What Is a Defibrillator? begins with an explanation of how defibrillators work and the conditions they treat. I then discuss how doctors determine whether patients are good candidates for defibrillators and provides an overview of the implantation process. Potential complications both before and after defibrillator implantation are discussed, as is surgical recovery and follow-up treatment. For readers having difficulty with medical terminology, there is a helpful glossary at the back of the book. Patients, caregivers, and family members alike will benefit from these straightforward explanations. If you’re a candidate for defibrillator implantation, this book can help you approach surgery with a full understanding of the procedure and what it means to your quality of life. What is a Defibrillator? is available in print and electronic versions at Amazon.com (http://www.amazon.com/What-Defibrillator-Cardiologists-Patients-Providers-ebook/dp/B011EXAQL4/ref=sr_1_4?s=digital-text&ie=UTF8&qid=1438283493&sr=1-4). Are specialty hospitals more or less relevant as we move towards value-based care? A recent article from The Advisory Board Company found a group of hospitals that had an advantage when it came to providing an excellent patient experience: specialty hospitals. An Advisory Board analysis of recent Hospital Compare data suggests that specialty hospitals dominate the rankings when it comes to patient satisfaction. Patient satisfaction may not be the only benefit of a specialty hospital or “center of excellence.” We examined the demographics, complications, re-admissions, and accessibility of care in a community electrophysiology (EP) program to add to the body of knowledge of ‘real-world’ EP device implant complications. Two hundred and fifty consecutive patients who underwent device implantation by a single electrophysiologist in a new non-academic community hospital EP program starting from its inception in July 2008 were included for analysis. Standard procedures for implantation were used. Pacemakers, defibrillators, and generator changes were included; temporary pacemakers were excluded. Major complications were defined as in-hospital death, cardiac arrest, cardiac perforation, cardiac valve injury, coronary venous dissection, hemothorax, pneumothorax, transient ischemic attack, stroke, myocardial infarction, pericardial tamponade, and arteriovenous fistula. Minor complications were defined as drug reaction, conduction block, hematoma or lead dislodgement requiring re-operation, peripheral embolus, phlebitis, peripheral nerve injury, and device-related infection. This community cohort had similar ejection fractions but was older with worse kidney function than those studied in prior reports. 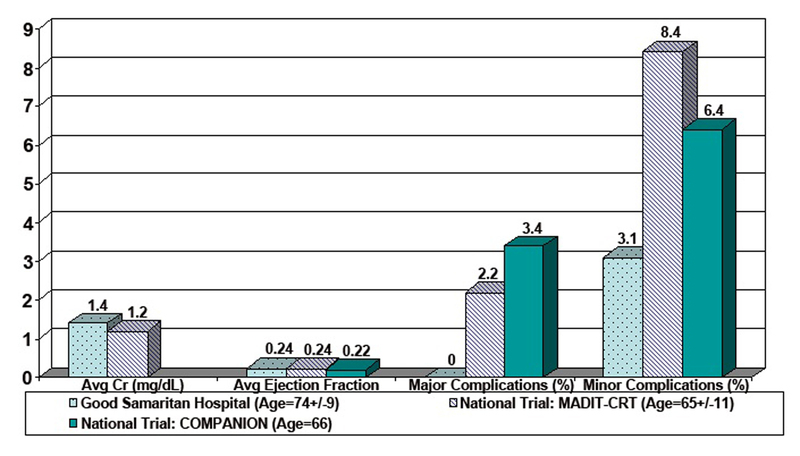 There was one major early complication (0.4%) and seven minor early complications (2.8%). Left ventricular lead placement was successful in 64 of 66 patients (97%). This was the first community-hospital based EP program to examine device implant demographics and outcomes, and revealed an elderly, ill population with lower overall rates of complications than seen in national trials and available reports from single non-community centers. Contrary to current perceptions, these data suggest that community centers may subselect an elderly, ill patient population and can provide high-quality, cost-effective, and more accessible care. Demographics and complication rates seen in this report versus those reported from non-community centers and national trials. Implementation of a Highly-Performing Electrophysiology Device Implant Program: Is There a Role for Niche Hospitals? A very active octogenarian with history of ischemic cardiomyopathy, CAD status post bypass surgery and congestive heart failure (CHF) presented for evaluation. He had a dual chamber defibrillator (ICD) implanted in 2006 because of sustained ventricular tachycardia (VT). His ejection fraction was 10-15% with extensive infarct and no evidence of ischemia on stress test. He was having shortness of breath with mild exertion (and resting at times) giving him Class 3/4 CHF. His electrocardiogram showed left bundle branch block and QRS duration of 160msec. He was scheduled for upgrade of his defibrillator to a biventricular defibrillator with the addition of a left ventricular (LV) lead placed percutaneously in his coronary sinus. Of note, his initial right ventricular ICD lead (Medtronic Sprint Fidelis) had to be replaced several years ago. 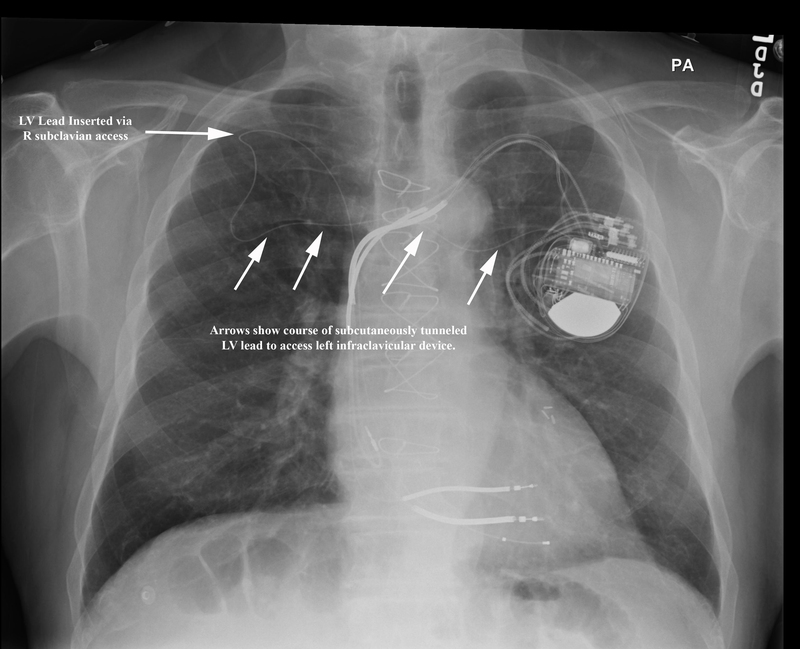 His in-situ ICD still had battery life and the decision was made to assess coronary sinus and left subclavian patiency prior to opening the ICD incision and risking device infection. Peripheral venogram of his left upper extremity revealed an occluded left subclavian vein in the midline (see Figure). Right femoral venous access was obtained and a 5French deflectable octapolar EP catheter was used to document coronary sinus patency. At this point, access to the left subclavian vein was attempted with the EP catheter without success. 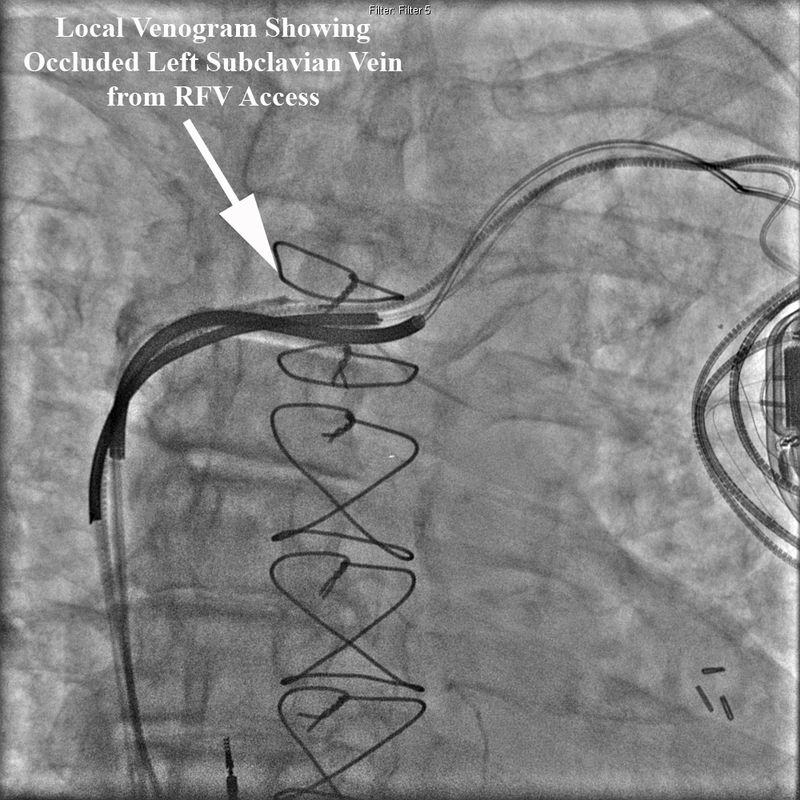 A local venogram was then performed using a 5French multipurpose catheter and once again demonstrated an occluded left subclavian vein from the contralateral approach. See Figure below. Given the patient’s extreme age, the decision was made not to attempt opening his chronic left subclavian venous occlusion or attempt laser lead extraction of the abandoned RV lead. We opted to place a coronary sinus LV lead via a patent right subclavian vein and percutaneously tunnel the lead to his existing left sided device. A 2cm incision was made in the right infraclavicular region and LV lead was placed without difficulty in a posterolateral branch of the coronary sinus. This lead was anchored to the right prepectoral fascia then tunneled subcutaneously to the exisiting left infraclavicular lead system. Tunneling was performed without incident and the patient underwent a successful upgrade to a biventricular defibrillator. The figure below depicts the chest xray and course of the tunneled LV lead. There was minimal postoperative discomfort along the course of the tunneled lead. A 60 year old with past medical history of tobacco abuse was admitted for evaluation of chest pain without significant electrocardiogram (ECG) changes, electrolyte abnormalities or troponin elevation. Stress test revealed fixed inferolateral defects with EF44% and associated hypokinesis. Interestingly, an echocardiogram revealed an EF 55-60% with no regional wall motion abnormalities. Catheterization revealed an obstructive lesion in the PDA that had drug eluting stent successfully placed. Approximately one hour after stent placement routine ECG did not reveal any significant acute changes and patient was asymptomatic (see Figure 1). Approximately 150min after stent placement, the patient had an episode of ventricular fibrillation (VF) that required an external DC cardioversion (see Figure 2). Repeat cardiac catheterization did not reveal stent thrombosis or spasm. The patient underwent an uncomplicated single chamber defibrillator placement the following day. VF arrest during PCI has been reported to have an incidence of 2.1% with higher incidence of VF during right coronary artery PCI. (HUA02) VF arrest during PCI is most commonly precipitated by contrast, ischemia from coronary dissection, embolism, spasm, or catheter manipulation and occurs during the cardiac catheterization. 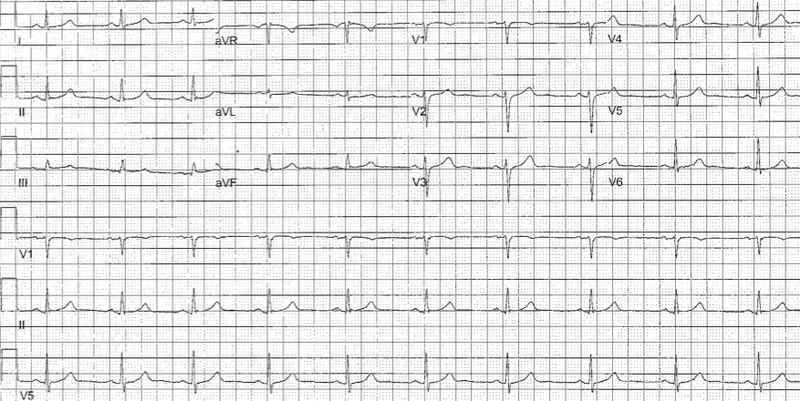 (NIS84) VF arrest after elective percutaneous coronary intervention (PCI) is uncommon. Indeed, an examination of 19,497 patients undergoing PCI revealed a 0.84% incidence of VF and no episodes of VF arrest temporally unrelated to vessel injection were reported. (ADD05) Survivors of VF arrest in the setting of myocardial infarction (MI) have similar mortality to those not experiencing VF arrest during acute MI. (DEJ09) In contrast, mortality in survivors of in-hospital cardiac arrest has been reported as high as 47% during a median followup of 1.3 years. (HEL11) It is unclear if the mechanism of VF arrest in our patient is secondary to PCI or rather a primary VF arrest. There is a prior report of delayed three vessel coronary spasm in a patient receiving paclitaxel drug-eluting stents however, coronary spasm was demonstrated on repeat catheterization in that report. (KIM05) Our patient did not report any ischemic symptoms preceding his VF arrest (though his EKG had subtle ST changes suggesting possible ischemia) nor did his repeat catheterization reveal vessel thrombosis, spasm, or dissection. Additionally, peri- and post-procedural myocardial injury from slow coronary flow, microvascular embolization, and elevated levels of troponin causing reperfusion tissue damage and cardiac dysfunction leads to worse long-term prognosis than those without myocardial injury (ISH08); our patient did not have significantly elevated pre- or post-procedure troponin levels. The time course of ischemia-induced reperfusion changes is likely less than 30minutes based upon prior experimental models of ischemia. (WIL08) Five minutes of coronary artery occlusion avoids increased risk of ventricular arrhythmias in animals and 30 minutes is appropriate for adequate reperfusion. (DAV81,DAV82,RUF79,WIL08) When the left anterior descending artery is transiently occluded in dogs, there is an initial (t=0-2minutes) small decrease in peak R wave amplitude and conduction velocity followed by a large increase in these indices over the ensuing 1-2minutes. (HOL76) There is a rapid return to baseline when occlusion is released and reperfusion occurs. This biphasic response has also been documented in dogs undergoing circumflex artery occlusions lasting 5minutes. (DAV81,DAV82) However, Ruffy et al (RUF79) found that LAD occlusions for 5 minutes in the dog resulted in a decrease in electrogram R wave amplitudes with no biphasic response. The progressive decrease in R wave amplitude (with the subsequent increase in amplitude) has been demonstrated in isolated rabbits hearts during global ischemia over 10 minutes (KAB89), isolated pig hearts during LAD occlusions for 5 minutesJAN86, and humans subject to 60minutes of unresolved ischemia. (VAI94) Of note, these electrical alterations were rapidly reversible upon reperfusion. (HOL76,RUF79,KAB89,JAN86) In summary then, our patient experienced a VF arrest 150min after elective PCI without conclusive evidence of procedural-related ischemia and well outside the conventional 30min window of reperfusion electrical alterations seen in experimental models. The role of defibrillator implantation as secondary prevention in patients like this is unclear. HUA02 Huang JL, Ting C-T, Chen Y-T, Chen S-A, “Mechanisms of ventricular fibrillation during coronary angioplasty: increased incidence for the small orifice caliber of the right coronary artery,” International Journal of Cardiology, Volume 82, Issue 3 (March 2002), pp. 221-228. NIS84 Nishimura RA, Holmes DR Jr, McFarland TM, Smith HC, Bove AA, “Ventricular arrhythmias during coronary angiography in patients with angina pectoris or chest pain syndromes,” Am J Cardiol. V. 53, No. 11 (June 1984), pp. 1496-9. ADD05 Addala S. Kahn JK, Moccia TF, Harjai K, Pellizon G, Ochoa A, O’Neill WW, “Outcome of Ventricular Fibrillation Developing During Percutaneous Coronary Interventions in 19,497 Patients Without Cardiogenic Shock,” Am J Card, V. 96 (2005), pp. 764-765. HEL11 Helton TJ, Nadig V, Subramanya SD, Menon V, Ellis SG, Shishehbor MH, “Outcomes of cardiac catheterization and percutaneous coronary intervention for in-hospital VT/VF cardiac arrest, Catheter Cardiovasc Interv, [Epub ahead of print], (July 6, 2011). DEJ09 DeJong JSSG, Marsman RFHenriques JPS, Koch KT, de Winter RJ, Tanck MWT, Wilde AAM, Dekker LRC, “Prognosis among survivors of primary ventricular fibrillation in the percutaneous coronary intervention era,” Am Heart J, V. 158, No. 3 (September 2009), pp. 467-472. KIM05 Kim JW, Park CG, Seo HS, Oh DJ, “Delayed severe multivessel spasm and aborted sudden death after Taxus stent implantation,” Heart, V. 91, No. 2 (Feb 2005 Feb), e15. ISH08 Ishiia H, Amanoa T, Matsubarabv T, Murohara T, “Pharmacological Prevention of Peri-, and Post-Procedural Myocardial Injury in Percutaneous Coronary Intervention,” Current Cardiology Reviews, V. 4. No. 3 (August 2008), pp. 223-230. WIL08 Williams JL, Mendenhall GS, Saba S, “Effect of Ischemia on Implantable Defibrillator Intracardiac Shock Electrograms,” J Cardiovasc Electrophysiology, Vol. 19, No. 3 (March 2008), pp. 275-281. DAV81 David D, Naito M, Chen CC, Michelson EL, Morganroth J, Schaffenburg M, “R-wave Amplitude Variations During Acute Experimental Myocardial Ischemia: An Inadequate Index for Changes in Intracardiac Volume,” Circulation, V. 63, No. 6 (June 1981), pp. 1364-1370. DAV82 David D, Naito M, Michelson EL, Watanabe Y, Chen CC, Morganroth J, Schaffenburg M, Blenko T, “Intramyocardial Conduction: A Major Determinant of R-wave Amplitude During Acute Myocardial Ischemia,” Circulation, V. 65, No. 1 (January 1982), pp. 161-167. RUF79 Ruffy R, Lovelace DE, Mueller TM, Knoebel SB, Zipes DP, “Relationship between Changes in Left Ventricular Bipolar Electrograms and Regional Myocardial Blood Flow during Acute Coronary Artery Occlusion in the Dog,” Circulation Research, V. 45, No. 6 (December 1979), pp. 764-770. HOL76 Holland RP, Brooks H, “The QRS Complex during Myocardial Ischemia,” Journal Clinical Investigation, V. 57 (March 1976), pp. 541-550. KAB89 Kabell G, “Ischemia-Induced Conduction Delay and Ventricular Arrhythmias: Comparative Electropharmacology of Bethanidine Sulfate and Bretylium Tosylate,” Journal Cardiovascular Pharmacology, V. 13, No. 3 (1989), pp. 471-482. VAI94 Vaitkus PT, Miller JM, Buxton AE, Josephson ME, Laskey WK, “Ischemia-induced changes in human endocardial electrograms during percutaneous transluminal coronary angioplasty,” American Heart Journal, V. 127, No. 6 (June 1994), pp. 1481-1490. JAN86 Janse MJ, “Electrophysiology and electrocardiology of acute myocardial ischemia,” Can J Cardiology, Supp. A (July 1986), pp. 46A-52A. Can Wireless Charging be a Disruptive Force in the Medical Device Industry? Nokia has introduced a smart phone that can charge itself wirelessly. (http://www.nokia.com/global/products/lumia/) It is safe to assume that Nokia uses induction based technology to charge the phone. The phone (equipped with a special receiver) is placed on a mat that generates an electromagnetic field. The phone’s special receiver uses this electromagnetic field to charge the phone’s battery. This technology can only power one device at a time and may generate heat during the charging process. Recently, IDT and Intel partnered to announce the development of an integrated transmitter and receiver chipset for Intel’s wireless charging technology based on resonance technology. (IDT and Intel Partnership) Magnetic resonance uses electrical components (a coil and a capacitor) to create magnetic resonance. 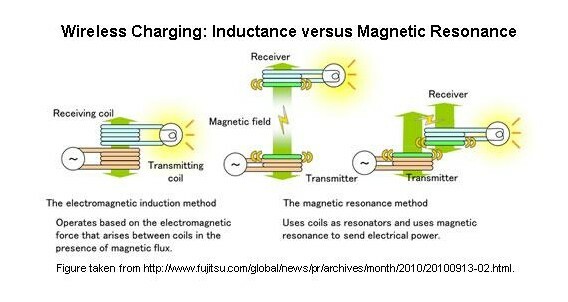 This resonance can then transmit electricity to the receiver (device to be charged) from the transmitter (charging base). Magnetic resonance can power multiple devices at a time and may not generate excessive heat. A nice summary of this technology is available at Fujitsu Summary of Wireless Charging. These technologies can be disruptive forces in the medical device industry that rely on battery depletion and replacement for subsequent sales (e.g., pacemakers, defibrillator, and noncardiac pulse generators). The device company that incorporates wireless charging into their devices may minimize replacement procedures for patients (and limiting procedural risk) while at the same time stabilizing their market position. Future device upgrades may be software upgrades and licensing that can be performed wirelessly without need for invasive procedure. Approximately 180000 patients undergo pacemaker implantation in the U.S each year . In addition, the extreme elderly are the most rapidly growing segment of the U.S. [2,3] and pacemakers are commonly implanted in this population. There are reports of pacemaker implant complications (generally clinical trials reporting outcomes and incident complication rates) and fewer reports of complication rates in the extreme elderly (with a persistent exclusion of elderly patients from ongoing clinical trials ). A comprehensive review of pacemaker implant complications can help improve informed consent in preoperative patients. Major and minor complications are defined based upon prior reports of device-related complications. [5,6,7,8] Major complications have been defined as death, cardiac arrest, cardiac perforation, cardiac valve injury, coronary venous dissection, hemothorax, pneumothorax, transient ischemic attack, stroke, myocardial infarction, pericardial tamponade, and arterial-venous fistula. Minor complications have been defined as drug reaction, conduction block, hematoma or lead dislodgement requiring reoperation, peripheral embolus, phlebitis, peripheral nerve injury, and device-related infection. This chapter will include discussion of common and uncommon complications of pacemaker implantation including associated incidence as well as the associated radiographs and common clinical signs of these complications. There are many reasons for difficult CS access including Thebesian valves, cardiac vein ostial valves, and Chiari networks. 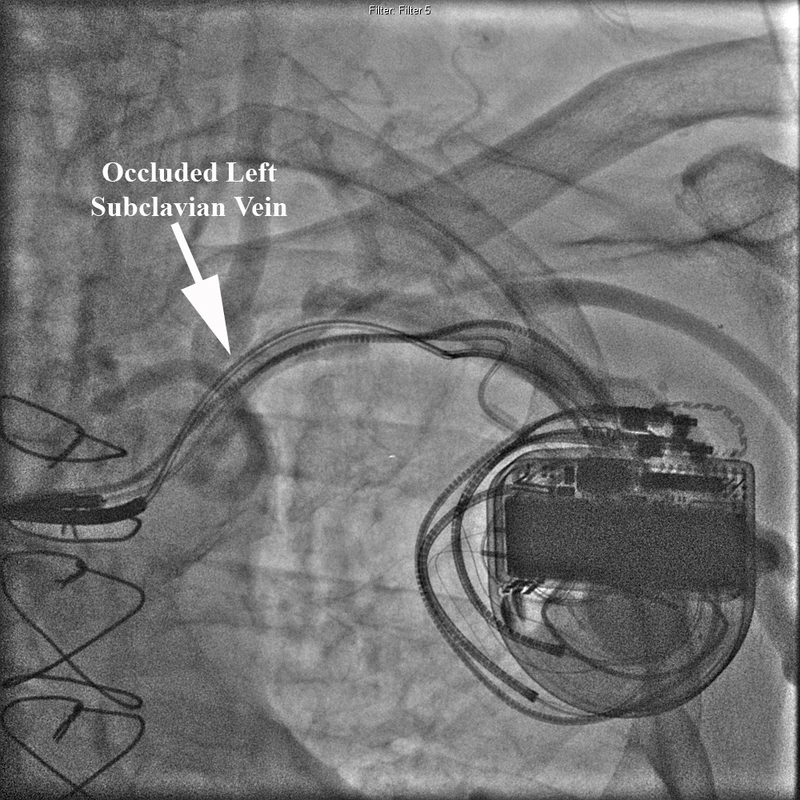 The image shown below is representative of the ostial valve of the coronary sinus (aka, Thebesian valve) that prevents engagement of the CS and ultimately precludes LV lead placement. Routine attempts at engaging the coronary sinus with deflectable EP catheters as well as hydrophilic guide wires were met without success. A 9MHz radial intracardiac echo (ICE) probe (UltraICE, Boston Scientific Corp) was introduced via a steerable sheath (Agilis, St. Jude Medical) to evaluate the CS anatomy. 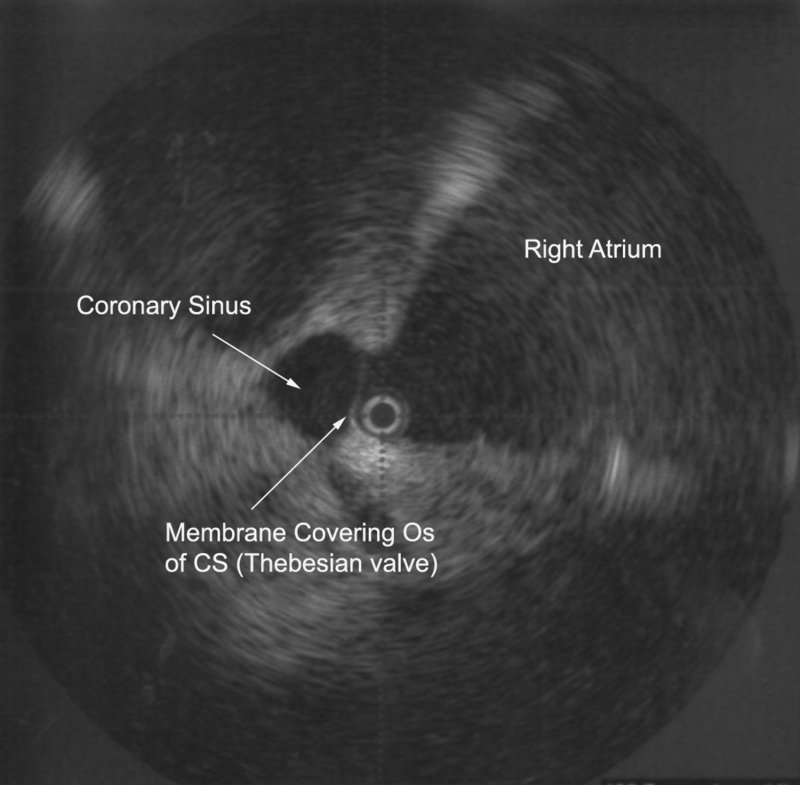 This image demonstrates a Thebesian valve covering the entire CS osmium with no obvious accessible fenestration or defect. LV lead placement was aborted and patient was referred for epicardial LV lead placement via cardiothoracic surgery. Prior reviews of CS anatomy (PEJ08) revealed the presence of Thebesian valves in 80% of cases and Chiari networks were found in 10% of cases. It covered one-fifth in 7%, one-third the os in 29%, one-half in 27%, two-thirds in 14%, and the entire os in 5%. The average diameter of the CS os was 8mm with a range of 3-15mm. Appreciation for the anatomic variations of the normal human CS as well as experience with ICE may help reduce complications and improve success of LV lead implantation. LEO05 Leon AR, Abraham WT, Curtis AB, et al. ; for the MIRACLE Study Program, “Safety of Transvenous Cardiac Resynchronization System Implantation in Patients with Chronic Heart Failure: Combined Results of Over 2000 Patients from a Multicenter Study Program,” J Am Coll Cardiol, 2005;46(12):2348–56. BRI04 Bristow MR, Saxon LA, Boehmer J, et al., “Cardiac-Resynchronization Therapy with or without an Implantable Defibrillator in Advanced Chronic Heart Failure for the Comparison of Medical Therapy, Pacing, and Defibrillation in Heart Failure (COMPANION) Investigators,” N Engl J Med, 2004;350(21):2140–50. DIV08 D’Ivernois C, Lesage J, Blanc P, “Where are left ventricular leads really implanted? A study of 90 consecutive patients,” Pacing Clin Electrophysiol, 2008;31(5):554–9. WIL10 Williams JL, Lugg D, Gray R, Hollis D, Stoner M, Stevenson R, “Patient Demographics, Complications, and Hospital Utilization in 250 Consecutive Device Implants of a New Community Hospital Electrophysiology Program,” American Heart Hospital Journal, V. 8, No. 1 (Summer, 2010), pp. 33-39. PEJ08 Pejkovic B, Krajnc I, Anderhuber F, Kosutic D, “Anatomical Variations of the Coronary Sinus Ostium Area of the Human Heart,” J Int Med Research, V. 36 (2008), pp. 314-321. Background: Single-center reports on patient demographics and early (<6 weeks) device complication rates in academic hospitals are scant and non-existent for non-academic community hospital electrophysiology (EP) programs. Objective: The objective of our study was to examine the demographics, complications, re-admissions, and accessibility of care in a community EP program to add to the body of knowledge of ‘real-world’ defibrillator implant complications. Methods: Two hundred and fifty consecutive patients who underwent device implantation by a single electrophysiologist in a new non-academic community hospital EP program starting from its inception in July 2008 were included for analysis. Standard procedures for implantation were used. Pacemakers, defibrillators, and generator changes were included; temporary pacemakers were excluded. Major complications were defined as in-hospital death, cardiac arrest, cardiac perforation, cardiac valve injury, coronary venous dissection, hemothorax, pneumothorax, transient ischemic attack, stroke, myocardial infarction, pericardial tamponade, and arteriovenous fistula. Minor complications were defined as drug reaction, conduction block, hematoma or lead dislodgement requiring re-operation, peripheral embolus, phlebitis, peripheral nerve injury, and device-related infection. Results: This community cohort had similar ejection fractions but was older with worse kidney function than those studied in prior reports. There was one major early complication (0.4%) and seven minor early complications (2.8%). Left ventricular lead placement was successful in 64 of 66 patients (97%). Conclusions: This is the first community-hospital based EP program to examine device implant demographics and outcomes, and revealed an elderly, ill population with lower overall rates of complications than seen in national trials and available reports from single non-community centers. Contrary to current perceptions, these data suggest that community centers may subselect an elderly, ill patient population and can provide high-quality, cost-effective, and more accessible care.